The villa was built with a commitment to excellence and is truly a home for all seasons. 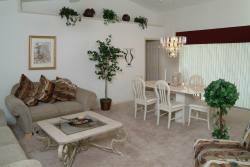 The open split floor plan provides you with spacious rooms as well as privacy. Currently there are wooded lots on either side of the property as well across the street. The master bedroom has an en-suite bathroom with his and her vanities, a gorgeous tub to relax in, and a stand-up shower. There is a 20' flat-screen TV with DVD to watch your favorite movie. 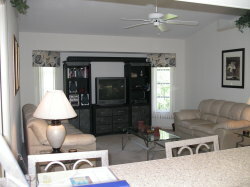 The 2nd bedroom also opens to the lanai and has a canal view. It features a double bed. The third bedroom has 2 twin beds and a canal view. The fourth bedroom has 2 twin beds. 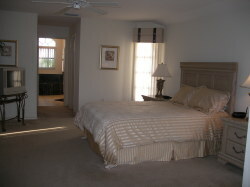 All rooms have wardrobes, ceiling fans, and spacious walk-in closets. The second bathroom has pool access. Linens, blankets, and towels are plentiful. 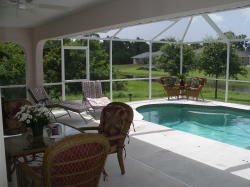 Our screened lanai has a gorgeous, fully maintained pool and beautiful furniture for both dining and lounging. We enjoy southern exposure so you can enjoy the warmth of the sun all day long! There is a safety fence that provides that extra bit of security for your little ones. Just minutes away you will find unspoiled sandy beaches, shimmering crystal -clear water, and endless blue skies. Take a drive to Boca Grande, dubbed the Nantucket of Florida. While you are there, try your luck tarpon fishing. You will experience old-world Florida at it�s best. If that�s not enough, Venice and Sarasota are a short drive away. The Orland theme parks are just a 2 � hours away. Bush Gardens and Sea World are a mere 1 � hours. The Everglades, Sanibel and Marco Island are within a reasonable driving distance. We have a Florida agent that will look after your every need. They have access to all excursions that might interest you. They can arrange boat trips, Jet Ski rentals, snorkeling and diving trips, kayaking rentals, and golf excursions.